We took our own sweet time to arrive at a set of team values. That's okay with me. It felt like a good pace for us given all of the variables: the ongoing work, the people, the novelty, and the uncertainty of the outcome. We took small steps, with space for review, with clarity on the next stage, and with consensus. For me, those questions framed the whole arc of our approach. The order feels logical for this kind of endeavour and provided us with a grounding that we could look back to if we needed it. That's not to say that the Why and What we created were complete, nor that we wouldn't change them. No-one with any experience and sense of reality about the world would expect perfection up front ... would they? Interestingly, the Why and What were relatively easy compared to the How. We quickly established good arguments for a set of values, and also the kinds of actions that we felt would motivate those values. Working out how to achieve it took a lot more and was, it seems to me, separated into two distinct parts: what mechanisms will we use to get to a set of values? and what should we do with our set of values to get the benefits we want? We managed to evolve an approach for the first question, with a lot of conversation along the way. We're still in the middle of the second. We are encouraging approaches that focus on risk and value; we are empowering ourselves to find ways (and time) to improve, and to feel safe to speak and act; we are setting ourselves up to explain what we're doing and why; and we are emphasising that all of these things are, to us, productive and valuable ways to go about our business. A important question: could we have achieved these aims in a different way? There is no doubt about it, we definitely could. This was one path through a massive space of possible approaches and we negotiated it reasonably cautiously. It felt crucial to me that we didn't lose anyone en route if these were to be shared values, but getting unanimity from a group of fifteen people is not always easy. Related: could this approach have achieved different values? Again, there is no doubt about it. A different set of people, in a different mood, on a different day, with a different facilitator or facilitation could easily have taken another route. And I think that it's possible that we'll revisit and change the values ourselves. As I've said, we didn't rush into these values. It was my intuition at the beginning that slow and steady, with plenty of scope and time for checking and chewing over, was the way to go. The elapsed period was around 8 or 9 months but at any given point we didn't require much time from each of us and, when we did commit time, we were committed to the task. I don't recall ever stating it explicitly, but one of my high-level goals was to try to keep the mechanics of the process out of the process as much as possible. When we got together to discuss this stuff, I wanted to be talking about the values much more frequently than how we would arrive at them. And how we arrived at them was incrementally. I might say that we were feeling our way into a process. You might say that we were (and particularly I was) making it up with each step. It wouldn't take much persuasion for me to agree that was a fair description too. But it wasn't a dictatorship: we talked about the process over the content at times, for example to decide that attendance would be optional and to time-box meetings at 30 minutes. In a story of values, it'd be good to wonder whether this effort was valuable. Instinctively, I do feel that it was but I don't have an objective measure to judge it by. Subjectively, I think that we understand each other and our attitude to our work better. I get the feeling that, despite our differences — and believe me, we are very different people — we share a lot of outlook, desire to help the company craft great products, and care to do a good job inside business constraints. It occurred to me at several points along the way, and again while writing up, that there's a strong analogy to the software development business here. In this case, our team took the role of stakeholders, implementers, and end users. Needing to state what we wanted, having to arbitrate in conversations between stakeholders, agreeing to relax requirements in the name of producing a thing, actually producing a thing, showing a thing to stakeholders, having a thing criticised by users ... all of these are roles performed by people we have to deal with all the time. And it doesn't hurt us to walk in their shoes from time to time. 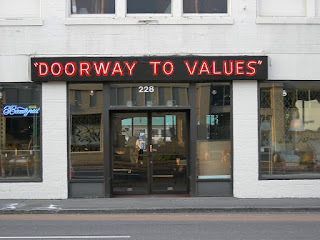 On a personal level, in writing this I wondered whether there were in fact two stories, or perhaps three, intertwined: the values we got, the way we got to those values, the way that I wanted to participate in getting us to the values. Not getting bogged down with process; as long as we were talking productively we continued. Accepting that we could leave some aspects ambiguous; until it's critical to resolve them. Giving all a chance to be heard; and feel they're being listened to. I have been on this kind of journey before to some extent, as a solo traveller. I have worked through what my management principles are, and encouraged the line managers in the Test team to do the same. I've also organised a cross-company sharing of management principles where many of the line managers presented three things that they felt were fundamental to how they work. Also, a year or two ago I found myself working through a definition of testing which involved many entertaining hours pondering semantics and my own perspectives on my work. The cut-and-thrust of that propose/challenge/respond dynamic, happening with two instances of me inside my own head, gives me enormous amounts of enjoyment. But it's not to everyone's taste and perhaps not so suited to a large group. On the other hand, the benefits that I have accrued from having a definition was something that I thought and hoped could be more generally acceptable: as a reference point, an anchor, for decision making. I ask myself: should I be testing now? If the answer is yes, then I can see whether or not the activity qualifies as testing for me. If it doesn't then I have to consider my priorities. If it does, then I can wonder whether it's the right testing. We can do the same thing as a team, using our values as a motivator, as an envelope, as a guide. But in all these cases, it must be heuristic — there may be circumstances in which we choose to do something else, but at least we'll expect to have taken a deliberate decision to do that, and understand why. I have found that reference to our values in conversations about priorities or how to react to circumstances can be extremely helpful. They might not tell us precisely what to do, but do give us guidance in the direction we should be looking to take. As I've repeatedly said (and it bears repetition) the conversations around what we're about were immensely informative and pleasurable devices for building a shared understanding, team spirit, and empathy. I'd like to thank: the Test team at Linguamatics for making and participating so deeply in such an interesting project, and crafting this set of tools for ourselves; Daniel Karlsson and Keith Klain who were kind enough to give me some of their time and background in what they were trying to achieve in their own similar projects.